SEPTEMBER 1982 - Two to three hours before this photo was taken the media had reported a wind gust peaking at over 160kph ( 100 Mph ) at Albion Park, about 3 milies from this spot. 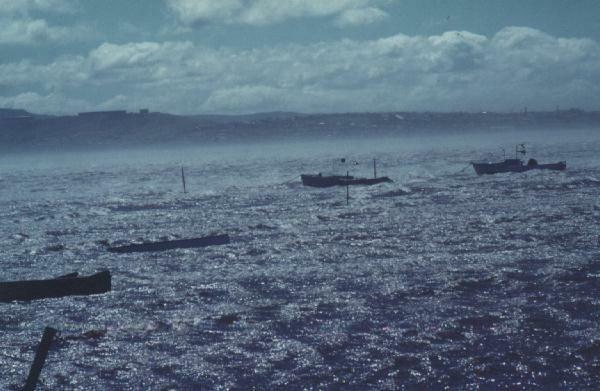 This photo is taken looking north from the south shore of Lake Illawarra and shows the still well in excess of gale force west winds ripping spray off the lake surface. The damage was surprisingly low, several roofs, a squash court at Albion Park and scores of trees. The Illawarra region receives its share of gale force west winds each winter and spring. The Illawarra escarpment to the west rather then protecting us from west winds actually accelerates them as they come off the southern highlands plateau. 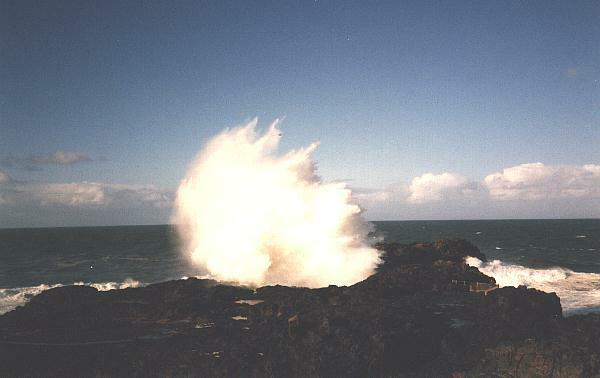 A huge swell crashes against Kiama Blowhole Headland. If you view this picture full size and look at the rocks on the right hand side you will notice a safety rail. This rail is about 1.5m ( 5ft ) high. The area in which the rail is located is about 12 - 15m ( 40-50ft ) above the ocean. There is also some fool at this rail. Seas like this can kill. In smaller seas at this same spot, but at a lower level,only about 2 years ago, six people were swept off the rocks and drowned.